When it comes to choosing the doors for your home, you will be faced with a huge choice! Externally, the type of door you choose will make a big difference to the look of your home. The appearance of your front door is something to think about very carefully – it’s one of the first things that people see. It needs to fit the look of your home and be welcoming. And with the back door, functionality is very important – will it be wide enough for you to get the laundry basket out, or for the kids and the dogs to spill out into the back yard?! Do you want an indoor/outdoor living style? Even a simple timber front door involves decisions – what colour? What furniture? (In the door world, ‘furniture’ is the accessories on the door, such as handles, knockers and hinges – be sure to choose ones that won’t tarnish outside.) Timber needs maintenance, while newer doors with laminate surfaces or made of fiberglass composites need less maintenance, or even none at all. 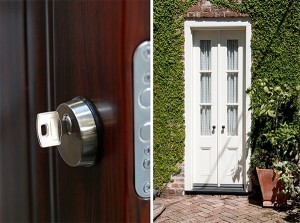 Don’t forget security – as well as locks, is the door itself solid enough to put off opportunist thieves? What about fire? Glass panels in your front door can help to shed light on a dim interior, but choose toughened glass for greater security. If you really want a secure door, choose a steel one! Pre-hung doors, which come complete with frame, are simple to install. Measure carefully if you are installing a new door in your existing home – while doors usually come in standard sizes it will be an expensive mistake if you measure incorrectly. Double front doors make an impressive entry and are practical too. If you have a narrow existing front door and would like to widen it or put in double doors, in most cases the size of your existing doorway can be increased, but this is a structural change that can be expensive. At the back of the house, the door is all about easy access to the yard – and usually also about letting plenty of light into the living areas to the rear of your home. Traditional hinged doors, often with glass panels, are useful for smaller homes, but glass sliding doors are more popular. Premade in specific sizes these doors are practical and economical and often incorporate a sliding insect screen. It’s important to make sure that safety glass is used in these doors, particularly when children and animals are in the home. Sliding doors do need some simple ongoing maintenance – it’s easy for tracks to become dirty and damaged. Alternatives to premade sliding doors are by-pass sliding doors, which are built to be bigger than the door opening and slide outside the face of the outside wall. Cavity sliding doors are built into the house during construction and slide into the wall cavity when opened, however, because they are incorporated into the structure, repairing or replacing the track on a sliding cavity door can be expensive. With ‘indoor-outdoor’ living growing in popularity, demand is increasing for bi-fold doors. These doors fold back concertina-fashion flat against the wall, maximizing the open area. Even the humble screen door comes in many variations, with a range of new options for more secure homes. From tougher wire that defies break ins to a decorative metal framework behind the screen – there are decisions to be made there too! Insect screens can be added to bi-fold, cavity and by-pass doors, either of the sliding variety or the type that pull down from above. However they do cut down on the ‘open air’ feel. Internal doors do not need to meet the same security standards as external doors and, in fact, many internal doors are hollow. This keeps costs down. Again, however, there is plenty of variety, from traditional paneled doors to modern minimalist options – and the same decisions on handles, hinges and other accessories! We are blessed with the wide variety of doors to decor the home interiors. Doors are to be specially chosen is this is the gateway, and should create enrapture one’s attention. Apart from the look and feel, ensure the functionality also.